Summer in Florida is hot. Luckily, there are many ways to stay cool when the weather heats up – ice cream and other cool treats, rides and shows with air conditioning, and best of all, getting wet. There are water rides in the parks, and of course great pools at the resorts for cooling off. But what if you want to combine both water rides and great pools? The answer is the Disney water parks: Typhoon Lagoon and Blizzard Beach. My family and I recently were able to visit both water parks in the same week. Which one is our favorite? There wasn’t a clear winner. Both are great for different reasons. 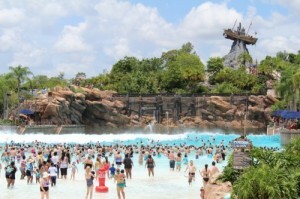 Typhoon Lagoon is a tropical paradise that was hit by a typhoon. The result is a whimsical water park. The landscaping is lush. The wave pool and the ship Miss Tilly perched atop Mount Mayday are focal points of the park. The paths are winding, and there is something new around every corner. 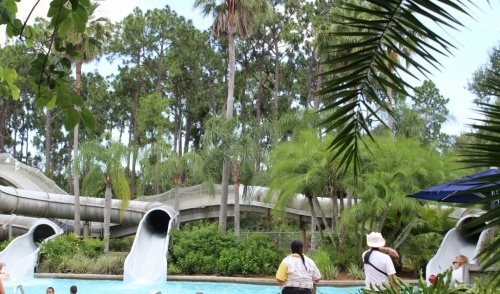 Water coasters, body slides, a family slide, a lazy river, shark pool, and more will fill your day with fun. 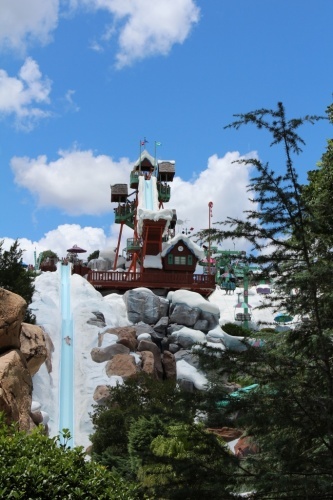 Blizzard Beach is a ski resort that is melting. It’s a mix of beach and Christmas, which is unlike anything else. The music throughout the park actually has some Christmas songs mixed in to the playlist. While there is plenty of shade, it is very white and bright because of all of the “snow” everywhere. 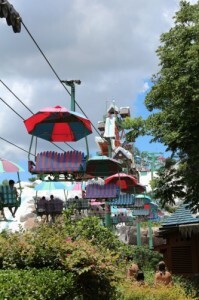 The focal point here is a giant ski lift that brings guests to three of the feature slides. There is also a very large area for younger kids, a lazy river, and a rolling wave pool complete with tubes for floating. Both parks have great kid areas as well. There are lots of places for the younger set to play – from toddlers to younger kids who might need a little more help. And both have life jackets free for kids (and adults) to use if needed. 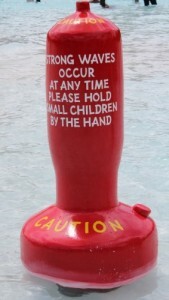 As for Blizzard Beach, there are some things I really love about it. The music is so much fun. 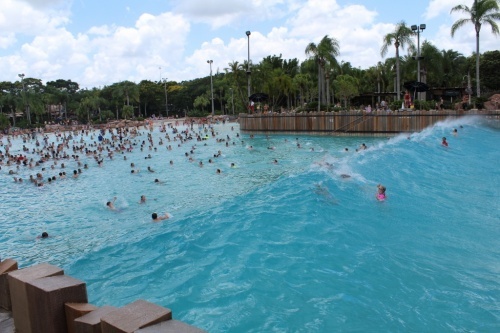 The wave pool is a little friendlier for the less adventurous swimmers. The lazy river is a wonderful place to just hang out, and for reasons I can’t quite put my finger on, I enjoy the lazy river here a bit more than Typhoon Lagoon. Although I don’t have little children anymore, the area for the younger set seems more appealing because of the fun “icebergs” that kids can try to cross. To get to the bigger slides at Blizzard Beach, guests take a ski lift. That is a fun ride in itself. The view at the top is wonderful. From the top you can see Mount Everest at Animal Kingdom. The family raft ride here is great fun, and can fit up to six passengers. That’s a big plus if you have a larger family and are always getting separated because attractions that only accommodate four people at a time. Summit Plummet is a great water slide, and although not for me, it’s fun to see the display on just how fast those guests are flying down the slide. All that being said, Typhoon Lagoon still holds a special place in my heart. I think it’s the lush and tropical theme. And the wave pool. It just can’t compare to a wave pool anywhere else. Guests can even take surfing lessons here (for an extra fee before the park opens) so this isn’t just any wave pool. I can still hear the giant “whoosh” of the wave, and the screams of delight of the swimmers. It is so much fun, that I can just hang out there. 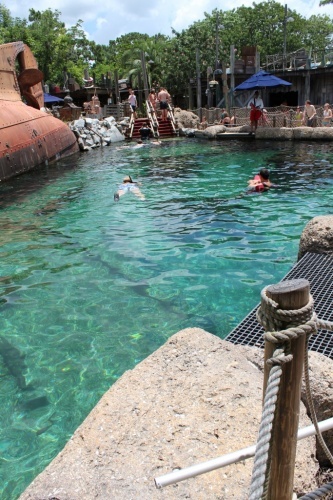 But Typhoon Lagoon has some other interesting things to see and do as well. Where else can you swim with the sharks at a water park? Guests can snorkel over the shark pool and see some great sea life – no experience required! If you don’t want to swim with the sharks, there is an observation area for guests to see first hand what the brave swimmers are experiencing. My favorite slides of the water parks are here as well – Crush N Gusher. There are three different options here on what is better described as a water coaster. 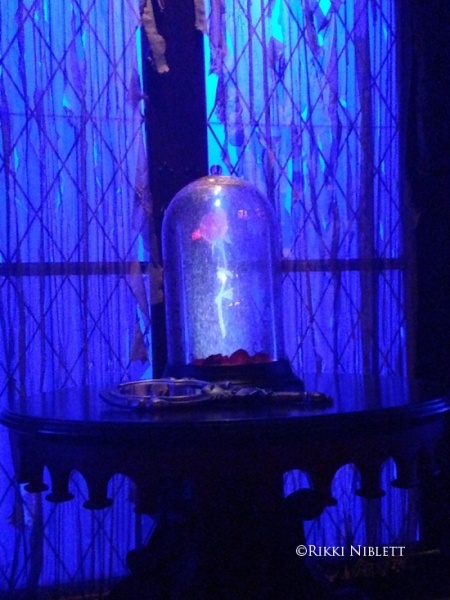 If you’ve seen the slide on the Disney Dream or Fantasy, it’s something like that but faster. This area has a great little pool and beach area as well, which makes it a nice place for families to hang out. There is so much more to the water parks than I’ve touched on here. While it might seem difficult to take a precious day out of your theme park touring, it’s definitely worth a try. 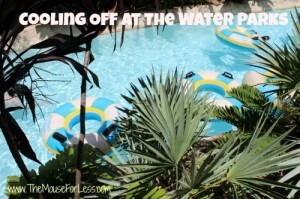 The heat doesn’t even seem to be an issue when exploring all of the water fun at either park. Carol is an avid Disney fan and (along with her husband) is raising three children to be Disney fans as well. Carol and her family enjoy traveling to Walt Disney World and Disneyland, and also enjoy cruising (on Disney Cruise Line, of course!) Carol is also an affiliate agent with The Magic For Less Travel and loves planning trips for her clients.